Things to do before you begin working in MOHRadiant. Do a quick write up on your level. Describe in writing how you want objectives to work. Identify things in your level other than objectives that will require scripting such as barricades and machine guns. Occupy: Attackers must remain in a designated space for a certain amount of time. Destroy: Attackers must ï¿½destroyï¿½ something at the objective area. Trigger and Hold: an attacker must hold down the use key at a designated space for a certain amount of time. Trigger and Defend: an attacker must trigger an event at the objective area. A scripted timer will then begin to count down. Defenders have the duration of the timer to switch off the event or else the objective is taken. Make a rough top-down sketch of your level.ï¿½ Your map will go through many revisions so its important to think things out on paper before you begin editing terrain. Identify where you want objectives to be placed, where you want spawn areas to be and where transition will be. MOHPA uses a Quad Tree method for terrain. This is a view of an in-progress terrain from the radiant 2d window. Each blue square is a Quad. Each Quad can be sub-divided into 4 equal, smaller Quads. (Clicking on the ï¿½TER in2dï¿½ button on the upper right button bar will cycle how the terrain is rendered between None, Wireframe, Textured, Shaded, and Quad Tree.) The Increase Resolution and Decrease Resolution terrain brushes described below can control the resolution of the quads. The first thing you will want to do for your map is create a new terrain and set an appropriate scale (size) for the terrain. File -> New Terrain creates a new terrain. Ctrl-Alt-T or Edit -> Terrain Mode brings up the terrain-editing window. In the middle right of the terrain Editing window there are 3 fields for scale.ï¿½ For an average Pacific Assault size multiplayer map (bougainville, gavutu), a scale of 12 12 12 should be adequate. A scale of 16 16 16 works well for a larger map like Matanikau or Gifu. Enter the 3 values in the fields and then click ï¿½Scaleï¿½ to update the size of your terrain. Its better to have too big of a terrain than too small.ï¿½ You can always later decrease the resolution on non-visible terrain quads to increase framerate. You can only have up to 3 textures on any 1 quad. A good, framerate friendly quad size is between 1024x1024 to 2048x2048 units per quad. Ctrl-Shift-Z is undo for terrain operations. There are a few primary Brush Types in the terrain editor that do most of the work. They all use the Cursor Properties values at the top of the Terrain Edit window to modify how they work. Outer Radius ï¿½ The effect of the terrain operation will drop off proportionally from full affect at the edge of the red inner radius disk to no affect at the edge of outer radius disk in blue-green. Amount ï¿½ Adjust this to control how quickly the terrain operation is applied to the existing terrain.ï¿½ High values alter terrain quickly, low values change it more subtly. be a slow 10% sprinkle. 90 would be a quick 90% solid spray of texture. Height ï¿½ When adjusting the terrain height, positive values will make the terrain go up, while negative values will make it go down.ï¿½ Making this value very big (or very negative) will have an effect similar to adjusting the Amount.ï¿½ For operations that involve sampling the current height of your terrain mesh, this will display the current height sampled by the cursor. Game Units/Meters ï¿½ This simply switches the units of the preceding 4 parameters from Radiant units to real-world meters. As you move the red dot representing your cursor across the surface of your terrain, you will see the disk representing the inner and outer radius matches the height of the current section of the terrain.ï¿½ Clicking the Left Mouse button in this mode will bring the terrain within the cursor disk to the height of the center of the disk. This will smooth the terrain within the cursor radius. 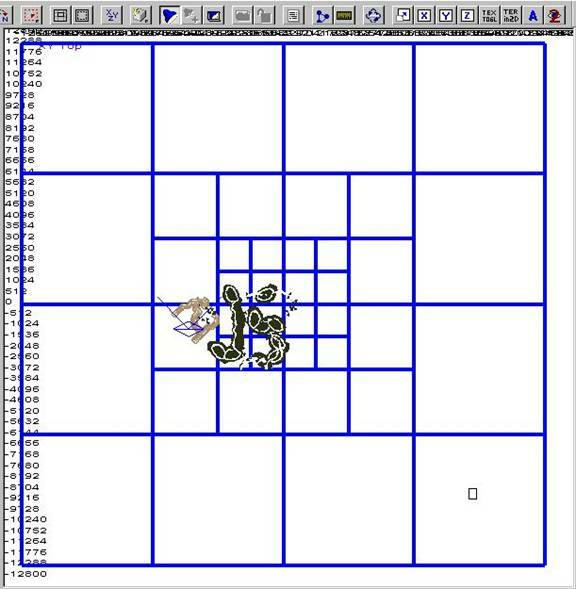 This will make a copy of the terrain underneath the cursor, leaving the area untouched. This will place a previously cut or copied section of terrain into the area under the cursor.ï¿½ How this is applied to the terrain is dependent on the Blend Mode setting.ï¿½ See the Current Material Section for more details. This will paint the material shown in Current Material box to the area within the cursor radius, but only if the Material has been added to that quad.ï¿½ See the Current Material section for more details. To directly set what available textures are being used on a particular Quad, in the 3d window shift-Right Click on a Quad to bring up a list ofï¿½ textures. On this list, textures that are checked can be painted on that particular Quad. There can be only 3 textures per Quad!!! This will remove the currently selected material from the quad and replace it with the base texture.ï¿½ In order to repaint the material onto the quad, you need to re-add the texture to the quad by using Shift Right Click. This will increase the resolution of the quad highlighted in red, forming 4 new, higher resolution quads in the same area as the previous quad. This will decrease the resolution of the quad highlighted in red, creating a larger, lower resolution quad from the selected quad and 3 other neighboring quads. ï¿½ï¿½ï¿½ï¿½ï¿½ï¿½ï¿½ï¿½ï¿½ï¿½ï¿½ 100% of what you see for level Geometry in Pacific Assault is now statically placed models. Brushes, as they have been traditionally used, are now obsolete and should not be used for level geometry. ï¿½ï¿½ï¿½ï¿½ï¿½ï¿½ï¿½ï¿½ï¿½ï¿½ï¿½ Getting started with placing models is very simple. Just right Click on the 2d top down view and navigate in the menu to ï¿½modelsï¿½ and the pull-out menus from there. The majority of the vegetation assets are under ï¿½models/mission4/naturalsï¿½ and ï¿½models/mission5/naturalsï¿½. Shift-left Mouseï¿½ï¿½ï¿½ï¿½ï¿½ï¿½ï¿½ï¿½ï¿½ï¿½ï¿½ï¿½ï¿½ï¿½ï¿½ï¿½ï¿½ï¿½ï¿½ï¿½ï¿½ï¿½ï¿½ Selects what you are clicking on. Shift-Hï¿½ï¿½ï¿½ï¿½ï¿½ï¿½ï¿½ï¿½ï¿½ï¿½ï¿½ï¿½ï¿½ï¿½ï¿½ï¿½ï¿½ï¿½ï¿½ï¿½ï¿½ï¿½ï¿½ï¿½ Un-hides all hidden entities. Ctrl-Spacebarï¿½ï¿½ï¿½ï¿½ï¿½ï¿½ï¿½ï¿½ï¿½ï¿½ï¿½ï¿½ï¿½ï¿½ï¿½ï¿½ï¿½ï¿½ï¿½ï¿½ï¿½ï¿½ï¿½ï¿½ï¿½ Duplicates selected entity with same key-values. Rï¿½ï¿½ï¿½ï¿½ï¿½ï¿½ï¿½ï¿½ï¿½ï¿½ï¿½ï¿½ï¿½ï¿½ï¿½ï¿½ï¿½ï¿½ï¿½ï¿½ï¿½ï¿½ï¿½ï¿½ï¿½ï¿½ï¿½ï¿½ï¿½ï¿½ï¿½ï¿½ï¿½ï¿½ï¿½ï¿½ï¿½ï¿½ï¿½ï¿½ï¿½ï¿½ï¿½ï¿½ï¿½ Toggles rotate. Instead of moving when the model is dragged, the model will now rotate. Ctrl-Shift-Eï¿½ï¿½ï¿½ï¿½ï¿½ï¿½ï¿½ï¿½ï¿½ï¿½ï¿½ï¿½ï¿½ï¿½ï¿½ï¿½ï¿½ï¿½ï¿½ï¿½ï¿½ï¿½ï¿½ï¿½ï¿½ï¿½ï¿½ï¿½ï¿½ Toggles ï¿½Terrain Hugï¿½ on selected entity. Useful for roughly placing a model on the terrain. Select->Randomize Entitiesï¿½ï¿½ï¿½ï¿½ï¿½ï¿½ Opens a window that will allow you to ï¿½randomizeï¿½ the selected entityï¿½s rotation and scale. Very useful for randomizing large amounts of models. ï¿½ï¿½ï¿½ï¿½ï¿½ï¿½ï¿½ï¿½ï¿½ï¿½ï¿½ For every objective in an Invader map, there is an event that happens when players move to a designated place and do an action. The game uses volumes called Triggers that are placed in the level to determine when a player is at the right place, performing the action for an objective. For some objectives like an occupation, players merely have to stand in a trigger volume. Other objectives have more complicated game play such as planting a bomb or activating a radio. Complicated objectives may have several trigger volumes that are placed in order to facilitate the game play. Making a trigger volume is very simple. Create a brush volume by left clicking on the 2d window and dragging out the appropriate sized box. Make sure the trigger has is slightly taller than the player. Give your box the ï¿½triggerï¿½ texture by selecting your box, pressing ï¿½Sï¿½ for the surface editor and then in the Texture Name field, type in ï¿½common/triggerï¿½ and then hit OK. Your box should now have a green transparent texture with the word ï¿½triggerï¿½ tiled across it. Lastly, to convert your brush to an entity, select your brush, right click and in the menu select classes->Trigger->Multiple. 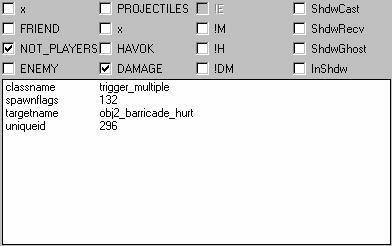 Most all of the triggers in invader are Trigger_Multiple. A few triggers are Trigger_Use. Below are some guides as to how to make machine guns and barricades work. ï¿½ï¿½ï¿½ï¿½ï¿½ï¿½ï¿½ï¿½ï¿½ï¿½ï¿½ There are 4 things you need for a static machine gun. The machine gun .hag model. A trigger_use entity for using the machine gun. The model for the ammo-box. A trigger_multiple for reloading the machine gun. ï¿½ï¿½ï¿½ï¿½ï¿½ï¿½ï¿½ï¿½ï¿½ï¿½ï¿½ The Base model. This is going to be the tripod model on which the machine gun will operate. For the TKO maps, we used models/statweapons/model92mp_base_stand.hag. Place this model where you want the base of the machine gun to be. setting up. In this example, this machine gun is the only machine gun in the map so I have given it ï¿½#set 1ï¿½. A second machine gun elsewhere in the map would have a key value of ï¿½#set 2ï¿½, ECT. will set up for the reload_trigger. In this case, the reload trigger for this machine gun is named ï¿½model92_1_reloadï¿½. targetnameï¿½ï¿½ï¿½ï¿½ï¿½ï¿½ï¿½ model92_1ï¿½ï¿½ï¿½ï¿½ï¿½ï¿½ the unique name for the machine gun base model. ï¿½ï¿½ï¿½ï¿½ï¿½ï¿½ï¿½ï¿½ï¿½ï¿½ï¿½ A trigger_use. This is the volume that players can operate the machine gun from within. Make a brush the size that you want for the trigger and convert it to the appropriate entity by right clicking on the brush and selecting classes->trigger->use. Place this trigger right behind the machine gun where youï¿½d want players to use the machine gun from. The trigger should also be taller than the player. ï¿½ï¿½ï¿½ï¿½ï¿½ï¿½ï¿½ï¿½ï¿½ï¿½ï¿½ The Ammo-box. Place the model models/weapons/mg_ammostack/mg_ammostack_axis.hag where you want the ammo-box for the machine gun to be. ï¿½ï¿½ï¿½ï¿½ï¿½ï¿½ï¿½ï¿½ï¿½ï¿½ï¿½ A trigger_multiple for reloading the gun. Make another brush that covers the ammo-box model you placed. Convert this brush by right clicking and selecting classes->trigger->multiple. *Important* this trigger cannot touch the trigger_use that was set up behind the machine gun. This trigger volume should also be taller than the player. ï¿½ï¿½ï¿½ï¿½ï¿½ï¿½ï¿½ï¿½ï¿½ï¿½ï¿½ There are 4 things you need in order to make a working destructible barricade.ï¿½ The Barricade Model, the bomb model, a trigger_multiple that players stand in to arm/disarm the bomb, a trigger_multiple to take damage for the barricade from explosions. The Barricade Model like models/mp_common/manmade/tank_barricade_med.hag. targetnameï¿½ï¿½ï¿½ï¿½ï¿½ï¿½ï¿½ unique_targetnameï¿½ï¿½ï¿½ï¿½ï¿½ï¿½ï¿½ The barricade needs a unique targetname. The c4-bomb model, which is models/mp_common/manmade/us_demolitionpack_nologic.hag. players will arm the bomb from. targetname ï¿½ï¿½ï¿½ï¿½ï¿½ï¿½ unique_targetnameï¿½ï¿½ï¿½ï¿½ï¿½ï¿½ï¿½ The bomb model must have a unique targetname. A trigger_multiple from which players will be able to plant the bomb. A trigger multiple that will take damage from grenades and satchel charges. ï¿½Not_playersï¿½ and ï¿½Damageï¿½ must be checked. targetname ï¿½ï¿½ï¿½ï¿½ï¿½ï¿½ unique_targetnameï¿½ï¿½ï¿½ï¿½ï¿½ï¿½ï¿½ the targetname must be unique. ï¿½ï¿½ï¿½ï¿½ï¿½ï¿½ï¿½ï¿½ï¿½ï¿½ï¿½ Setting up water in MOHPA is similar to what other games have. First, create a brush the size of the water volume you want. Next, Right Click on your brush an make it into a water entity by selecting classes->water. ï¿½ï¿½ï¿½ï¿½ï¿½ï¿½ï¿½ï¿½ï¿½ï¿½ï¿½ Hereï¿½s an example of the ocean from bougainville. As far as what type of water to check, youï¿½re best to stay with ï¿½Oceanï¿½ to begin with. Itï¿½s the most efficient of what is available. Interactive water will do fancy interactive water type behavior when shot but is expensive to render. 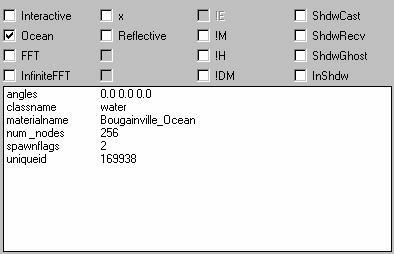 Reflective water will reflect the environment around it but itï¿½s basically like rendering your scene twice.ï¿½ The FFT water types do not work. many vertices will be in your water. A lower num_nodes value will result in a lower detail but faster rendering water. ï¿½ï¿½ï¿½ï¿½ï¿½ï¿½ï¿½ï¿½ï¿½ï¿½ï¿½ In multiplayer, the TKO scripters have given level builders a simple method to play visual effects such as battle smoke and ambient explosions. ï¿½ï¿½ï¿½ï¿½ï¿½ï¿½ï¿½ï¿½ï¿½ï¿½ï¿½ First, your level must have a working level script. Take the example script and modify it to match your level. Make sure that the following line is being called at the beginning of your script. ï¿½ï¿½ï¿½ï¿½ï¿½ï¿½ï¿½ï¿½ï¿½ï¿½ï¿½ To place a visual effect, first create a script_origin at the location you want the effect to play at. To set what effect to play give your script origin a targetname selected from the list of effects below. Here is an example of a battle smoke effect from Bougainville. ï¿½ï¿½ï¿½ï¿½ï¿½ï¿½ï¿½ï¿½ï¿½ï¿½ï¿½ There are also some special parameters used for explosion effects. Here is an example of an explosion effect from Bougainville. randomization built in so this delay will not be constant. each time the effect goes off. spaced from each other in each volley. #spacingï¿½ï¿½ï¿½ï¿½ï¿½ï¿½ï¿½ï¿½ï¿½ï¿½ decimal this value controls the time between explosions in a volley. ï¿½ï¿½ï¿½ï¿½ï¿½ï¿½ï¿½ï¿½ï¿½ï¿½ï¿½ Like Visual effects, ambient audio is also handled through a script_origin. $aliasï¿½ï¿½ï¿½ï¿½ï¿½ï¿½ï¿½ï¿½ï¿½ï¿½ï¿½ï¿½ï¿½ï¿½ï¿½ï¿½ï¿½ï¿½ï¿½ï¿½ï¿½ï¿½ï¿½ï¿½ï¿½ï¿½ï¿½ the name of the audio alias from ubersound/ubersound.scr or ubersound/ubersound_mp.scr. $waitï¿½ï¿½ï¿½ï¿½ï¿½ï¿½ï¿½ï¿½ï¿½ï¿½ï¿½ï¿½ï¿½ï¿½ï¿½ï¿½ï¿½ï¿½ï¿½ï¿½ï¿½ï¿½ï¿½ï¿½ï¿½ï¿½ï¿½ the amount of time to wait before playing the audio again. There is some randomization built in so the effect will not always play at the same interval. ï¿½ï¿½ï¿½ï¿½ï¿½ï¿½ï¿½ï¿½ï¿½ï¿½ï¿½ Here is a table of the worldspawn settings for the mp_gifu_inv.map. you can modify the worldspawn settings by selecting a brush (shift-left-click) and opening the entity window (n). The distance from the player to 100% fog. Anything more than the farplane distance from the player will not be rendered. The color of the farplane fog. The dapple texture that is applied to player models when the player is in shadow. the northyaw key value sets what direction will be north on the in-game compass. The model used for the sky. Rotation and elevation of the global light (sun). The ambient color for the level.